You must make reservations at least 5 minutes in advance of the time at The Standard Pour. Located behind The Standard Pour, we offer public parking (metered) Sunday evening thru Tuesday and Valet parking Wednesday thru Sunday brunch. McKinney Ave Transit Trolley Stops directly outside The Standard Pour. Available to accommodate any size parties up to 100 guests. We offer special food and beverage menus customized to specific needs and requirements. Semi private and private areas available. The Standard Pour is a Craft Cocktail & Dining destination. 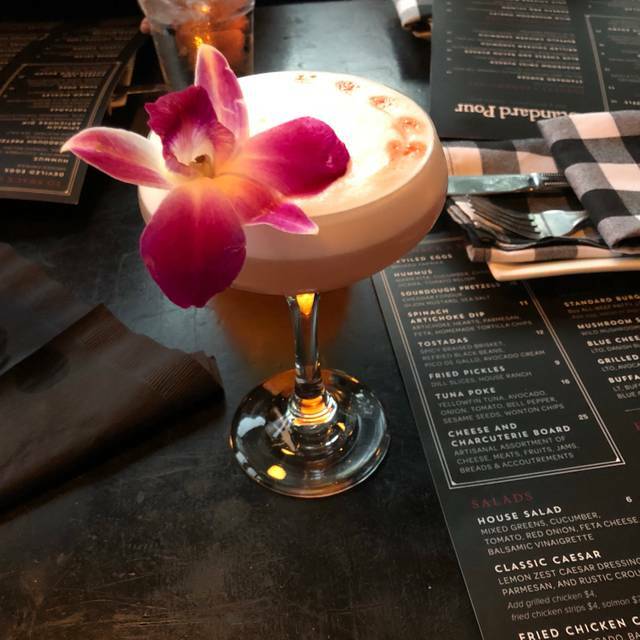 Serving one of Dallas's most advanced Mixology Programs, as well as one of the Top 50 Bourbon selections in America, The Standard Pour remains a local neighborhood favorite with an incredible scratch kitchen and truly inviting service. Chef Chad Brown's seasonal menu of shared plates & entrees, compliments the artisanal selection of cocktails, spirits, and boutique wines by the glass. Located in the heart of Uptown, The Standard Pour offers a timeless, casual & yet sophisticated atmosphere. With warmly lit brick & dark woods, accented with filament sconces & library liquor shelves, The Standard Pour truly provides an easy to love environment for all occasions. Four Roses Sm. Batch LTD. ED. Highland Park 17yr Ice ED. Four Roses Small Batch LTD. ED. Knob Creek 9yr TSP ED. Very loud on a Sunday with live music, but otherwise the food and service are excellent. The mimosas and food were great! Really enjoyed brunch here! Really enjoyed standard pour for the ladies night! Great cocktail list! Loved it! The pretzels were delicious, service was super attentive, fun atmosphere! Great food and service. Outstanding cocktails. This is definitely a jewel of the neighborhood (and the city). Food was delicious and the service was impeccable. Waited 15 minutes for a host to seat us. Service was painfully slow. Food was meh. Brunch was very nice! first time coming here and loved it! We had a great time! The food was good and the atmosphere was relaxed. A fun low-key birthday brunch, with a menu that worked for everyone! We had friends in from Austin and thought we’d take them somewhere new...but big mistake. First, the host originally sat us right by the entrance door and the temp outside was 35. I asked the host if he thought we’d get too much of a cold draft so close to the door and he said, “I don’t know” and opened the door for us to feel...letting in a bunch of cold air. When we asked to move to a warmer table, he twice informed us that they “had a lot of reservations” (well, we HAD made reservations so not sure what his point was). He did move us, and table was okay, but nothing special. We thought there would at least be a cool vibe, but NOTHING. Don’t get the Spinach & Artichoke dip...runny and flavorless. But the biggest disappointment was that 2 of our party ordered the Bacon and Blue Cheese Burger and they came out room temperature. We were out if there in an hour. Instead of hanging out and trying various Craft drinks, we couldn’t wait to get out of there. We are now at another bar, buying drinks here. Had reservation and was seated right away. 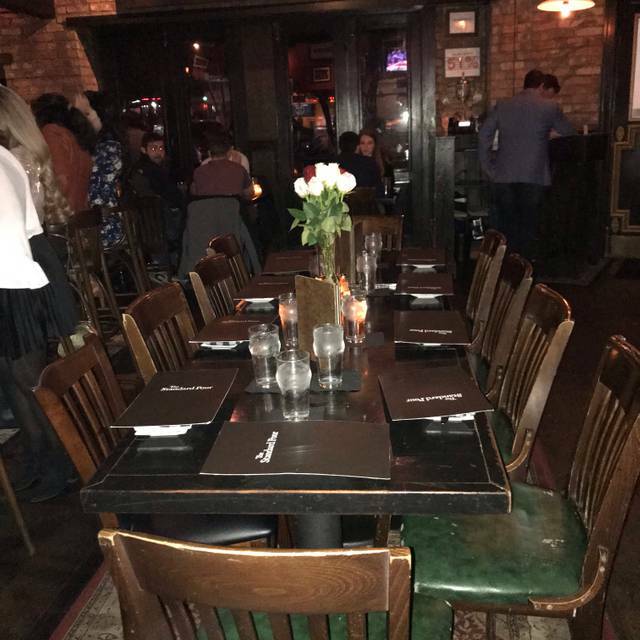 Several private events distracted the wait staff to the point where we didn’t have service for 15-20 minutes. Management was helpful when asked questions about menu. I’d give it another chance. This was my first time visiting Dallas. I found this local restauant/bar in the open tanker app. It was a really nice place, comfortable, friendly, wish I could go back before I leave. A real find. First time there- hubby had visited once for a happy hour and recommended for our son’s 21st Birthday brunch. We made reservations on open table- Wonderful host greeted us at the door, Great atmosphere- Amazing Musician, fabulous server, delicious food, scrumptious mimosa carafe for the table... all set in a toasty porch setting, covered from the elements. Delightful all around!! We will return!! As always, the Standard Pour never disappoints. The service is as my wife calls it, "a well oiled machine". the food for brunch is terrific and Goga is the best for afternoon entertainment. For us, it is worth the 25 mile drive. I hosted my girlfriend’s birthday dinner at Standard and Pour. Everything was perfect. The staff provided excellence and went above and beyond to make the party amazing! Thank you, Jenna. You were great! Definitely a neighborhood favorite for great service, food and ambiance. I ate here for the first time in December and the food was wonderful. I had Tuna Poke and Korean BBQ Salmon. I was in town and decided to go back to have the Poke again. Ended up ordering the Salmon. Boy night and day. This time smaller portion of Tuna that was more mush than the healthy cuts of tuna from the previous time. Even the chops were slightly burned and over cooked. As for the salmon, under cooked. The sticky rice was lukewarm and crunchy. Not sure what happened to the kitchen in 1 month but disappointed with the effort. We were pleasantly surprised to find out The Standard Pour had happy hour on the weekends. Score!!! $5 in Uptown is a steal of a deal and the food is good as well. The atmosphere gets lively as the night progresses, but the service stayed consistent throughout the night. I'll be back. Our waitress was AMAZING! She saved us from some unwanted men hitting on us! Great food and atmosphere! So fun! I love this place, it’s great for drinks and appetizers. Think good food, great service, and really enjoyable live music during brunch. Our server, Caylin (sp?) went above and beyond - we had some finicky eaters at my table, and they accommodated everyone’s needs. Exceptional weekend brunch - thank you! Just a cool place to hang and get great food! The food was awful!! They were out of several drinks too. Will not be back. Very interesting food selections. Great service and awesome atmosphere. Excellent service and impeccable selection of spirits... food was delicious too! We had a party of six, including an 8 year old, and we’re comfortably seated on the enclosed patio. The food was okay - two of us had the Korean salmon and it was great. Two had the chicken and thought it was dry. The music is pretty loud, but typical of a bar. It’s a fun atmosphere. Obviously great selection of bourbons. Forrest did a great job of tending the bar. Shout out to the kitchen. Salmon and tuna poke outstanding. The food is amazing and so is the entire staff! The music was way too loud Seated at the wall booth behind the host stand. Awesome place!! Come here for Ladies night in Wednesday’s. Make sure to make a reservation because they fill fast. Food is always super yummy. I also enjoy eating at Standard Pour. Since they have new management a couple of months ago I have missed the 50% off food on Mondays and $2 taco Thursday's. I attended ladies night for the first time and the waitstaff was attentive as always, great lighting, a little noisy - but that was due to the large table next to us, and the salad and crusted chicken was delicious. I give this review 4/5 stars due to the dessert - the brownie was rock hard and not worth the effort to try to chew it. I look forward in going back in the future! Great place for a work happy hour! Really enjoyed our time there. Severs were nice and decently efficient. Entertainer was talented and diverse. Food unfortunately was mediocre but not priced as such. I had the chicken and waffles from the menu and it was great. The food is outstanding, wait staff is amazing, Goya is incredible! Best brunch in Dallas! Amazing as always and excellent service from Jenna!